It is merely human nature to show off expensive things and it’s only natural to show off a really expensive watch, phone, or a car. However, it is all well and good until it backfires (pun intended) upon you. Sportscar owners especially love to show off their ride. Who wouldn’t, right? But some times things just don’t go so smoothly. Take the example of a recent incident in Dubai. A video surfaced of a Lamborghini bursting into flames as its driver was busy revving his engine for a Ferrari driver, because when you’re at a signal, you need ways to pass the time and snag a quick selfie. The video shows a Lamborghini Aventador at a signal with the owner trying to impress a man in a Ferrari in front of him, who appears to be taking a selfie. In doing so, the owner goes a little overboard and soon the back of the sports car catches fire. Meanwhile, you can hear people around yelling out to the owner, warning him about the fire, but he drives off anyway. Moments later, the car is completely in flames and luckily the owner was out of the car and unharmed. It’s safe to say that the Ferrari driver got the better deal. What is it with Lamborghinis catching fire? A similar incident happened last month in South Delhi’s Badarpur area, where a Lamborghini Gallardo caught fire and completely incinerated the back half of the car. 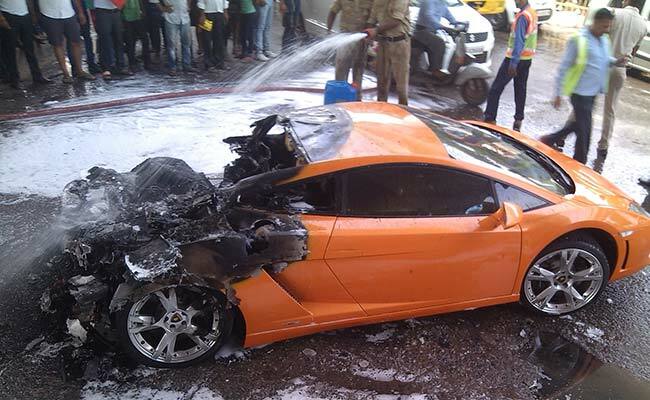 Much like the Dubai incident, the fire began near the rear of the Gallardo where the 5.2 litre engine lies.